Mega. New species for Panama if accepted. At least two adult males with distinctive glossy black plumage, conspicuous yellow eye and short (instead of long) strongly keel-shaped tail. 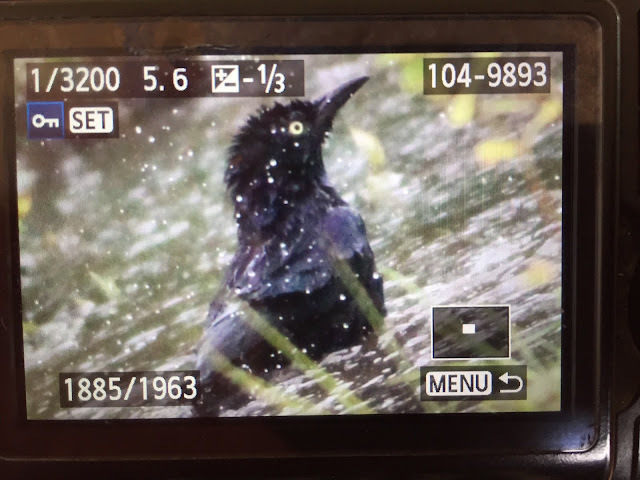 Seen with Great-tailed Grackles in a marshy, open area, where they feed in the ground (out of sight) and perched atop some low bushes and trees. Heard once. Then this morning, Carlos Bethancourt found some other ones at Tortí Abajo. We've been scrutinizing every grackle we've seen today since hearing about a Carib Grackle near Chepo yesterday. It appears that the scrutiny has paid off. 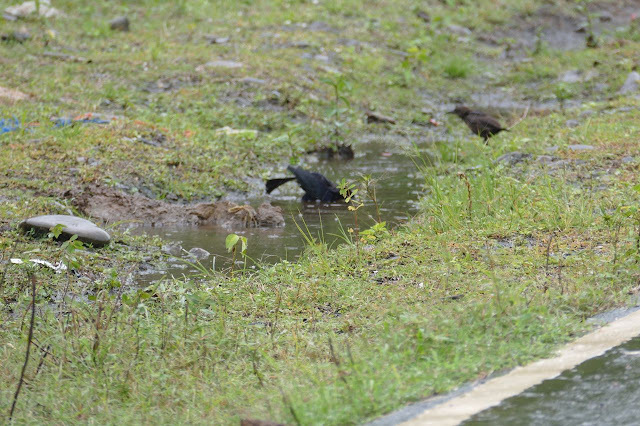 Today while leaving the site known as Torti Abajo we encountered four grackles (two males and two females) that caught our eye when we realized their noticeably small size. They were seen near the houses along the road just before the Río Torti. As they flew up from the roadside Carlos Bethancourt's initial thought was "Bronzed Cowbird". When they perched my initial thought, being from the United States, was "Brewer's Blackbird". This is when we knew we had something different. The birds were noticeably small-bodied, round-headed, and short-tailed. Their bills were also distinctly slender and slightly down-curved (much different in appearance the thicker and heavier hills of Great-tailed Grackle). Another distinct difference was head shape... these birds had small heads and rounded crowns, again, quite different from the blocky, flat-headed appearance of the Great-tailed Grackle. 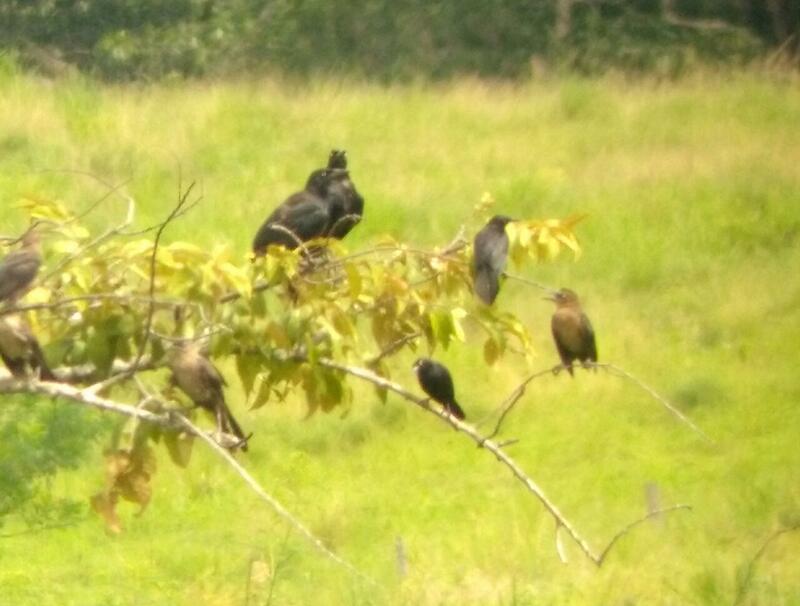 The males plumage was all dark with flashes of blue-green iridescence, not purple like in a Great-tailed Grackles. Certainly this is variable depending on lighting but it was noted regardless. 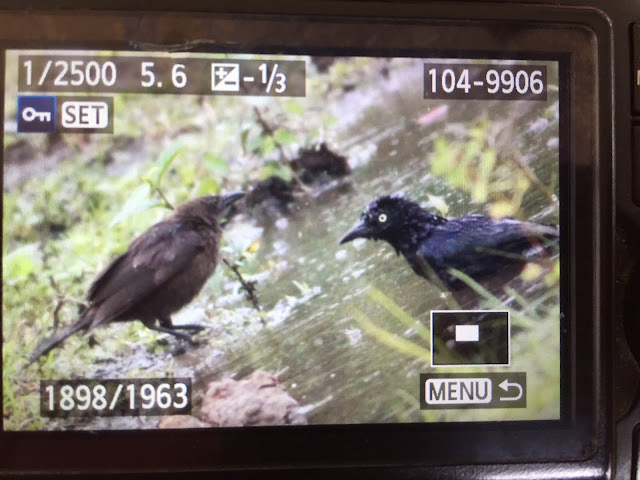 The female plumage was dark brown overall, with the face being the same color as the rest of the bird, more like that of a Common Grackle. As they flew they gave a soft liquid "jeer" call, repeated in sequence about once ever second. We heard about five call notes before they disappeared. 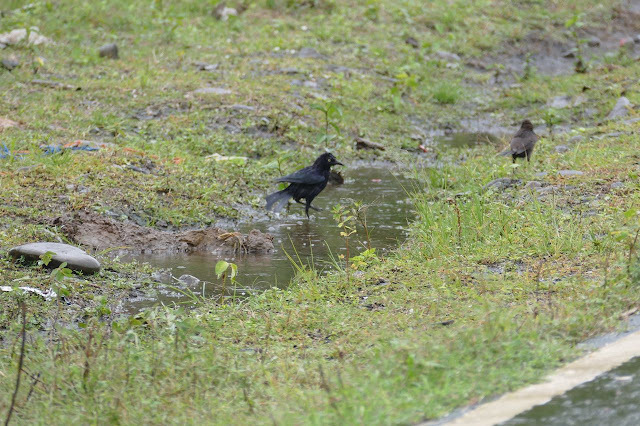 It was only after the observation that we realized the males were also the same size as the females, another field mark suggesting that these birds are not Great-tailed Grackles. Here's some back-of-camera shots taken by Michael Retter. 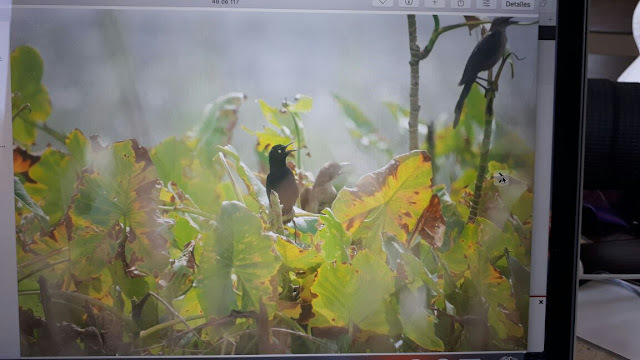 And then, upon looking at some photos of odd Grackles from Finca Bayano taken on August 15, Jan Axel found this one. So, one more bird new for Panama, which was probably hiding in plain sight since who knows when. Moral of the story: check every Grackle!